One item in our collection I have always been particularly curious about is a large, round, tin, with a slit in the top that rotates. Inside are about 50 wooden cases for sewing needles and shuttles (shuttles are the bobbin driver). What an interesting way to find the exact needle that you require, I always thought. After I looked into the product and company a bit more, it turns out that organization and efficiency was exactly the point. The Boye Needle Company began manufacturing wood �commodity cases� around 1903 in Minneapolis, MN. 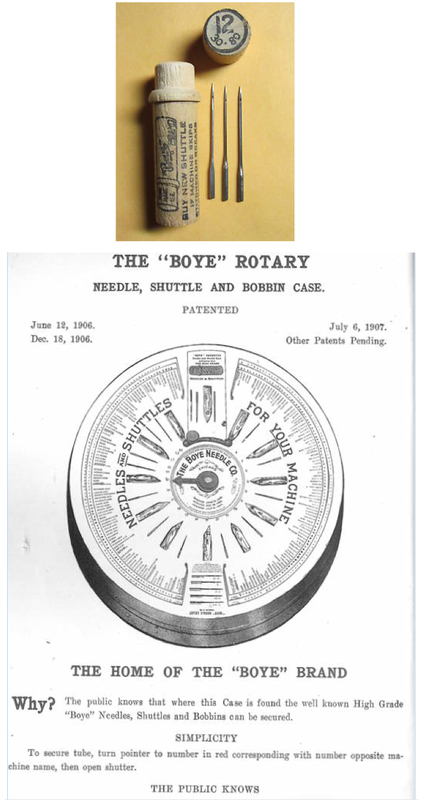 Founder James Boye�s idea was to provide a method for displaying and locating the correct needle or shuttle for the 20,000 different manufacturers that circulated throughout the sewing industry. Sewing machine manufacturers mass engineered supplies so that large retailers and mail-order companies could appear to have an exclusive line. The result was widespread confusion regarding which needle and shuttle fit which model and manufacturer. Boye discovered that among the 20,000 needles and shuttles, there were only about 15 different manufacturers with about 150 machine names. Boye�s goal was to index all the needles, shuttles and bobbins on the market and create a color and number coded system that allowed any general store owner to easily locate the correct needle for a customer. The index was included on the top of the case and a rotatable needle/pointer would indicate all the proper needles, shuttles, and bobbins for each manufacturer. If you weren�t certain about your sewing machine name or manufacturer, you could look at the pictures of the shuttles on the case and compare needle sizes. Frustrated seamstresses no longer had to personally contact manufacturers for replacement needles, nor wait for shipments. Brilliant! The tin commercial retail dispensers came out around 1909. The Museum�s case was originally used in the J.W. 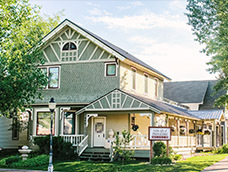 Hugus & Co. store in Steamboat Springs and was later displayed in the Ben Franklin store on Lincoln Avenue. The case was donated to the Tread of Pioneers Museum in 1971 by Paul Nelson.